Hospice Help Foundation is a 501(c)3 charity. As a not-for-profit organization, we rely on your support to accomplish our mission. All donations are tax deductible, and go help vulnerable hospice patients of all ages and backgrounds. Read the stories below to learn about how donors have helped in the past. An adorable 18-month old, Gemma was all smiles, despite being diagnosed at two months of age with a rare and terminal illness. Gemma’s hospice social worker applied to Hospice Help Foundation for assistance with monthly bills so that her parents, who were trained to provide the specialized care at home that Gemma required, could focus on the challenge of looking after their daughter during their brief time together. Donations from people like you went towards rent, utilities, car insurance, and food. A 43-year old hospice patient died, leaving behind a husband and two teenage daughters. Not having enough money to pay for the burial, her husband had to take out a loan in an amount that would be nearly impossible for him to pay back. The hospice team that cared for his wife appealed to the Foundation for help. The appreciation he expressed after receiving a check to cover the funeral costs was deeply moving. Joe spent his life farming—planting and harvesting crops, deriving joy from being in the fields. Since being diagnosed with a terminal illness, Joe can only get outside safely in a rented, motorized wheelchair. No longer planting and harvesting, Joe still takes great pride in inspecting the crops and visiting his farm animals. Because funding for the motorized chair is no longer available through Joe’s insurance plan, the hospice team who cares for Joe requested assistance from the Foundation to cover the cost of a new chair. Your donations helped make it possible for Joe to continue to get outdoors and be part of the farm he has loved and operated all his life. What would it be like to be 46 years old, paraplegic, unable to speak and living in a nursing home? John’s hospice team asked for funds to purchase a laptop computer and a mouth-operated mouse so that he could communicate with his friends and family. Without donations from the community, granting this request would not have been possible. Mr. Smith told his hospice chaplain that he longed to take his wife to a fancy restaurant for a memorable dinner, but with mounting medical expenses, it seemed like that would never happen. He talked in detail about wanting to get dressed up and take his wife on a date. The Foundation was able to purchase dinner for two, along with transportation to and from the restaurant for this man and his wife. Because of your generosity, this couple experienced an evening that will never be forgotten. A hospice patient died in a nursing facility. Her body was taken to the funeral home but, with no next of kin and no available funds, the funeral home was unable to bury her. 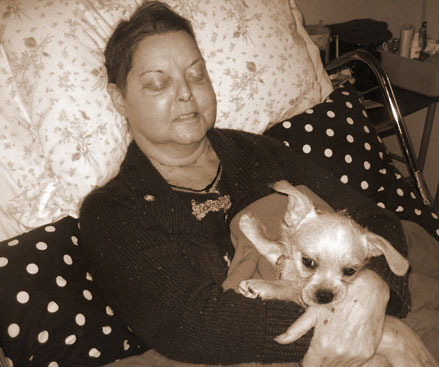 Six weeks later, the funeral director contacted hospice and asked for help, as her body was still at the funeral home. The social worker contacted the Foundation for help. Your contribution, along with the willingness of the funeral home to donate some services, allowed this patient to receive a proper burial. For years Nancy wished for a dog who would sit on her lap and give her kisses, and that’s exactly what Crumbs likes to do. The Foundation was pleased to provide the funds to obtain Crumbs, a rescue dog, and to pay all associated costs. An elderly gentleman was caring for both his wife and his mother, each of whom was receiving hospice services. When he became unable to shovel the driveway, one of the patients could no longer go to weekly therapy appointments. The hospice team requested funds to purchase a snow blower for this family, making it possible for the caregiver to clear the driveway during the winter months. These stories were all made possible thanks to the support of people like you. Make a quick and secure donation.